What are my rights to film a police encounter? What information should I record, and how? I’ve just filmed police abuse. What should I do with the video? What are the most effective ways to share it? While there is no right or wrong answer to most of these questions, the decisions an eyewitness makes before, during and after filming can determine how effective their footage can be in achieving accountability for injustice. To address these questions, we’ve compiled a list of resources from groups like American Civil Liberties Union (ACLU), Electronic Frontier Foundation (EFF), CopWatch, People’s Justice, and WITNESS, that provide guidance for those who film police encounters in the U.S. They are divided into the following categories: Know Your Rights, Filming Techniques, Livestreaming, Distribution & Reporting, and Preservation. Below are a few recommendations from each category. You can view the full list here. Additionally, there are numerous groups across the country that take part in Copwatch, a decentralized network of groups that pro-actively document police interactions in their communities as a de-escalation tactic and a form of community self-defense. If you are interested in getting involved, we encourage you to get in touch with these groups for additional training and guidance on interacting with local police. Here are just a few suggestions: California – Ella Baker Center Justice Teams, Anti Police-Terror Project, Texas – Peaceful Streets, Missouri – WeCopwatch/St. Louis First Responders, New York – Copwatch Alliance, El Grito de Sunset Park. Let us know if there are other groups you’d recommend. 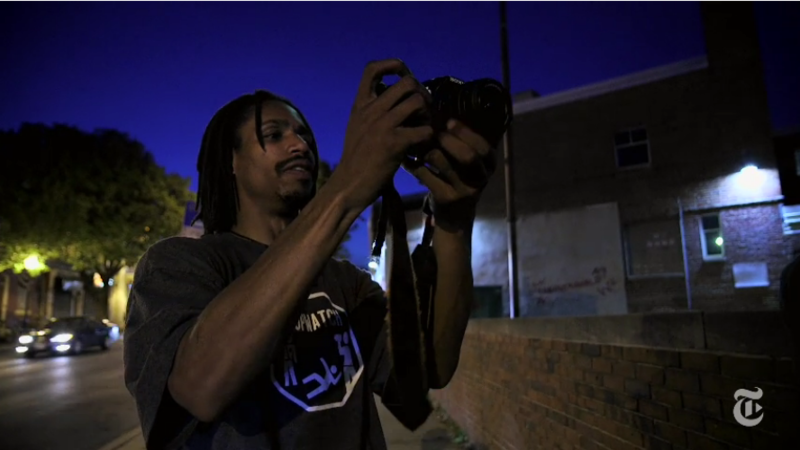 ACLU – Know Your Rights – Photographers: Good overview of your rights to photograph and film the police. Also spells out the particularities around recording audio in several states. Communities United for Police Reform (CPR) – Know Your Rights! Help End Discriminatory, Abusive and Illegal Policing: A nicely designed pamphlet on how to interact and respond to police in a variety of scenarios, including cop watching, stop-and-frisk, being pulled over in a car, etc. Focused on New York State, also available in Spanish. EFF – Know Your Rights – Phone and computer seizure: Focuses on the Fourth Amendment protection against unreasonable government searches or seizures of your computer or portable electronic devices, such as cell phones or cameras. WITNESS – Filming the Police in the USA and Filming Protests & Police Misconduct: Quick tips for safely and effectively filming protests and misconduct. WITNESS – Use This App to Film the Police…or Not: Guidance on filming with a mobile phone and tips on selecting and testing mobile apps for documenting police abuse. WITNESS – Video as Evidence: Basic Filming Practices: This is aimed at helping eyewitnesses and activists use video to document abuses and support the process of bringing perpetrators to justice and freeing the wrongly accused. See more video as evidence resources at vae.witness.org. BBC – Live-streaming the Ferguson protests: A BBC crew tested out Meerkat during a February 2015 protest in Ferguson, MO. The article discusses their process, the challenges they encountered and their overall impression of the app. WeCopWatch – Live Streamers Make Great Informants: This article outlines some of the security and privacy issues around livestreaming protests, along with various ways that livestreaming can harm the protest organizers’ strategy and planning. It highlights good and bad livestreaming tactics. WITNESS – 4 Ways to Save Your Lives Video Broadcasts. WITNESS – How We Can Use Livestreaming Apps to Promote Justice: Explores how livestreaming has been used in recent protests around the world and some of the possibilities and risks involved in using live video to document human rights violations. National Lawyers Guild – National Police Accountability Project – This site provides a long list of attorneys across the U.S. and promotes the accountability of law enforcement officers through trainings for legal professionals, public education and more. WITNESS – You Caught Police Abuse on Camera. Now what? WITNESS – Ethical Guidelines: Using Eyewitness Video in Human Rights Reporting and Research. WITNESS – Authenticating Online Video: This is an important resource to review if you are sharing videos that others have filmed. The guide outlines four basic steps that can be taken to determine whether or not the content of an online video is authentic. Find more verification tools on the WITNESS Media Lab. WITNESS – Activists Guide to Archiving Video: Archiving video is an essential, but often overlooked component of video advocacy. Learn best practices for organizing, storing, preserving, and sharing your footage. WITNESS also produced a series of short videos covering archiving basics, such as Planning to Preserve Video for Human Rights, Deconstructing Digital Video for Activists and What is Video Metadata? This is part of an ongoing effort to assess the needs for filming police abuse safely and effectively, and we need your help. What resources have we missed? Where would you like to see more guidance? Please share your thoughts in this form or Tweet them to @witnessorg. We look forward to hearing from you!